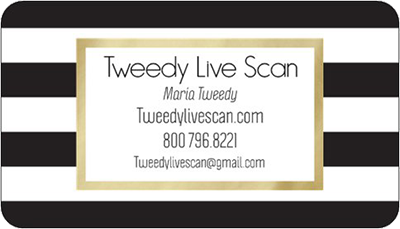 Tweedy Live Scan is proud to provide mobile live scan fingerprinting services to Los Angeles and the surrounding communities. Eliminating the need to travel to a fingerprinting location, we provide same day mobile appointments, 24 hours a day, seven days a week. We are available 24/7 at your convenience. We also offer same day service. Our mobile live scan specialist in Los Angeles uses a state-of-the-art system to scan your fingerprint, and securely transmit the scan to the Department of Justice for processing. We guide you through the live scan fingerprinting process to ensure a quick and efficient process. With our home office located in Los Angeles, California, our Mobile Live Scan service is a great solution for Los Angeles and the surrounding areas. With the process taking as little as 10-15 minutes to complete, it’s easier than ever to call us today to schedule a consultation! Copyright © 2018 Tweedy Live Scan.